When performing procedures on the hands and upper extremities, many options are available for anesthesia. General anesthesia techniques can be applied for hand and upper extremity procedures the same as for procedures on the rest of the body. However, regional anesthetics have a unique application for procedures of the hand, including axillary, Bier, wrist, and digital blocks. When used in the proper setting and patient population, regional anesthesia can be applied safely for procedures involving the upper extremities and the hands. In general, small needles and lower volumes of local anesthetic should be used in regional anesthesia to minimize the risk of neurovascular complications. Moreover, epinephrine can be used to augment local anesthetics to provide a longer duration of action, lower risk of adverse systemic effects, and less bleeding at the surgical site. The techniques of administering regional anesthetics for hand surgery, the pharmacology of local anesthetics, and special conditions associated with hand surgery are discussed. Several local anesthetic agents are available for use in hand and upper extremity surgery. Clinicians must consider the requirements of the local anesthetic for each individual case, including the duration of the procedure, tolerance of the patient, and allergies to anesthetic agents. Knowledge of the basic pharmacology of local anesthetic agents is critical to proper selection of these agents for specific procedures and patient types. For more information, see Local Anesthetic Agents, Infiltrative Administration. Local anesthetics produce a transient block of nerve conduction by interfering with sodium channels. [2, 3] This effect of the anesthetic interferes with the development of an action potential across the nerve. Local anesthetics are classified into 2 groups, esters and amides, based on their organic structure. The clinical behavior between the 2 classes is significantly different. Local anesthetics of the ester class include cocaine, procaine, tetracaine, chloroprocaine, and benzocaine. The amide class of local anesthetics includes lidocaine, mepivacaine, prilocaine, bupivacaine, etidocaine, and ropivacaine. Regarding the metabolism of local anesthetics, esters are rapidly hydrolyzed by plasma pseudocholinesterase. The esters are more quickly metabolized by plasma pseudocholinesterase so that blood levels do not rise significantly to cross the placental barrier. Because chloroprocaine is the most rapidly hydrolyzed ester, it is the anesthetic drug of choice for pregnant women. Amides are degraded intracellularly in liver cells. The degradation of amides is a longer process, which results in some accumulation of the anesthetic and a greater chance of a systemic reaction, especially with repeat doses. A total of 27 bones constitute the basic skeleton of the wrist and hand. The hand is innervated by 3 nerves — the median, ulnar, and radial nerves — each of which has sensory and motor components. The muscles of the hand are divided into intrinsic and extrinsic groups. The median nerve is responsible for innervating the muscles involved in the fine precision and pinch function of the hand. It originates from the lateral and medial cords of the brachial plexus (C5-T1). In the forearm, the motor branches supply the pronator teres, flexor carpi radialis, palmaris longus, and flexor digitorum superficialis muscles. The anterior interosseus branch innervates the flexor pollicis longus, flexor digitorum profundus (index and long finger), and pronator quadratus muscles. The ulnar nerve is responsible for innervating the muscles involved in the power grasping function of the hand. It originates at the medial cord of the brachial plexus (C8-T1). Motor branches innervate the flexor carpi ulnaris and flexor digitorum profundus muscles to the ring and small fingers. Proximal to the wrist, the palmar cutaneous branch provides sensation at the hypothenar eminence. The dorsal branch, which branches from the main trunk at the distal forearm, provides sensation to the ulnar portion of the dorsum of the hand and small finger, and part of the ring finger. The radial nerve is responsible for innervating the wrist extensors, which control the position of the hand and stabilize the fixed unit. It originates from the posterior cord of the brachial plexus (C6-8). At the elbow, motor branches innervate the brachioradialis and extensor carpi radialis longus muscles. For more information about the relevant anatomy, see Hand Anatomy. See also the Technique section below for more details. The important regional blocks that can be applied for procedures of the upper extremity and hand include axillary, elbow, wrist, and digital blocks. These important blocks are briefly described below. The axillary block is a useful form of anesthesia for upper extremity procedures because of the ease of technique, low prevalence of complications, and reliability of analgesia in the C7, C8, T1 distribution. See the image below. Axillary block. Image courtesy of Wikimedia Commons. Many techniques of axillary block have been described. Modification of a perivascular technique described by Winnie that incorporates the production of paresthesias produces a high success rate in adults. The adult patient is positioned with the arm abducted 90 degrees and flexed at the elbow. The axillary artery is located at its proximal part in the axilla. After skin preparation, a short beveled needle is carefully inserted, seeking ulnar or median nerve paresthesia. When a paresthesia is felt at the fingers, the needle is fixed in that position. The anesthetic agent is infiltrated after aspiration confirms that the needle is not intravascular. Digital pressure distal to the needle tip and the use of a large volume (40 mL) of local anesthetic ensure blockade of the musculocutaneous nerve for the tourniquet area. The intravenous regional block, also known as the Bier block, can provide a reliable, safe, and easy alternative form of anesthesia for shorter procedures on upper extremities. The technique is limited in duration because of tourniquet tolerance;  no residual analgesia is present after the tourniquet is released, unless supplemental nerve blocks have been performed. The Bier block involves infusion of local anesthetic into a hand intravenous catheter on the ipsilateral side. Two tourniquets are placed around the upper arm. The arm must be exsanguinated with an Esmarch bandage before injection of the local anesthetic. After exsanguination of the hand, forearm, and upper arm to the distal tourniquet, the distal and proximal tourniquets are inflated, respectively. The distal tourniquet is deflated initially, and the first portion of the procedure is performed under tourniquet control with the proximal tourniquet. The tourniquets should be inflated to at least 100 mm Hg above systolic blood pressure. The local anesthetic is infused into the hand intravenous catheter. Lidocaine is the only anesthetic approved by the US Food and Drug Administration (FDA) for intravenous regional anesthesia. For a standard upper extremity Bier block, 50 mL of 0.5% lidocaine is used. [27, 28, 29, 20] During the procedure, patients often become less tolerant of the proximal tourniquet at 30 minutes. At this point, the distal tourniquet is inflated over an anesthetized area. The painful proximal tourniquet can then be deflated. At the conclusion of a shorter procedure, at least 15 minutes should pass before tourniquet release to minimize the possibility of a systemic toxic reaction. Contraindications to intravenous regional anesthesia include severe hypertension, peripheral vascular disease, infection, or surgery lasting more than 2 hours. Elbow blocks are rarely used for upper extremity procedures. Elbow blocks provide more muscle paralysis but no more anesthesia than wrist blocks for procedures on the hand. Occasionally, upper extremity nerves are blocked in this region as an adjunct to axillary blocks. The radial nerve can be blocked using an anterior approach, injecting 1 cm lateral to the biceps tendon and medial to the brachioradialis muscle. The sensory branch of the musculocutaneous nerve can be blocked in the subcutaneous tissue superficial to the deep fascia at the antecubital crease of the elbow, 1 cm lateral to the biceps tendon. The ulnar nerve is reliably located in the groove posterior to the medial condyle of the humerus, between the olecranon and the medial epicondyle, and can be blocked. Approximately 5-10 mL of local anesthetic is appropriate for blocking each of these nerves. See the images below. Wrist blocks are useful and thus are commonly used forms of regional anesthesia for hand surgery. [31, 32] Wrist blocks are easy to perform. However, because wrist blocks do not block sensation in the area of the tourniquet, they are most suitable for procedures lasting less than 30 minutes. Wrist blocks can be used for longer procedures when a forearm tourniquet is used in conjunction with a blockade of the medial and lateral antebrachial cutaneous nerves. The medial and lateral antebrachial cutaneous nerves can be blocked by injecting local anesthetic in a subcutaneous ring around the elbow. In performing a wrist block, the hand can be rendered insensate by blocking 4 nerves: the median, ulnar, superficial radial, and dorsal ulnar cutaneous nerves. See the images below. 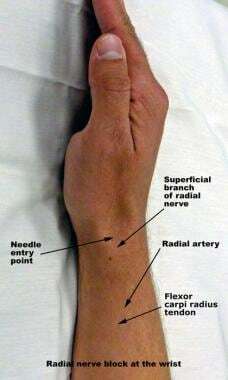 A small-gauge needle (ie, 25-gauge) and a maximum of 5 mL should be used to minimize the risk of nerve injury with this technique. The median nerve is located ulnar to the flexor carpi radialis tendon and deep to the palmaris longus tendon. The median nerve can be reliably blocked at the level of the proximal palmar crease of the wrist by eliciting a paresthesia beneath the deep fascia. An alternative technique of median nerve block has been described that involves insertion of the needle ulnar to the palmaris tendon. With either technique, the needle is inserted through the fascia but not deep enough to enter flexor tendons or the nerve. This can be confirmed by asking patients to open and close their fingers and determining if they have a shooting sensation in a median nerve distribution. The ulnar nerve is situated directly deep to the flexor carpi ulnaris tendon and its insertion into the pisiform bone. The ulnar nerve can be blocked by inserting the local anesthetic ulnar or radial to the flexor carpi ulnaris tendon. To avoid intra-arterial injury, aspiration is essential prior to injection because the ulnar nerve lies just ulnar to the ulnar artery. 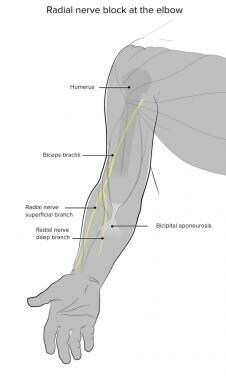 The superficial branch of the radial nerve divides into several branches in the superficial fascia at the level of the anatomic snuffbox. It is blocked by a wide subcutaneous infiltration of 5 mL of anesthetic agent slightly proximal to the radial styloid process. Perhaps the most frequently used block for hand procedures is the digital block. Each digit is innervated by 4 nerve branches, 2 dorsal and 2 volar. In the small finger, the dorsal digital nerves extend to the tip. For the other fingers, the dorsal digital nerve branches extend to the dorsal proximal interphalangeal creases. The dorsal nerve branches are extensions of the superficial radial nerve for the index and middle fingers. These digital nerves can be blocked dorsally and volarly. The volar approach involves one injection over the flexor sheath with 2-3 mL of local anesthetic directed toward each digital nerve radial and ulnar to the flexor. The disadvantage to this technique is that the palmar skin is very sensitive and the dorsal branches are not anesthetized. Therefore, in blocking the small fingertip, the dorsal branches also must be anesthetized. In using the dorsal approach, the dorsal branches can also be blocked. An advantage to the dorsal technique is that the dorsal skin is less sensate; thus, the dorsal approach is less painful. The dorsal approach is performed by injecting the dorsal skin first, creating a small wheal with 1 mL, then directing the needle ulnar and radial in the volar direction toward, but not into, the proper digital nerves, placing 2 mL on each side. Overall, allergic responses to local anesthetics are rare. [15, 2, 3] In general, patients are more likely to have an allergy to an ester anesthetic than an amide anesthetic. If the patient reports a true allergy with urticaria and airway obstruction, the patient is more likely to have had an allergic response to an ester anesthetic. If the patient has a history of allergy to a local anesthetic, an intradermal test can be performed with a small quantity of local anesthetic to evaluate for a reaction. Allergic responses to amide anesthetics are extremely rare, and amide anesthetics can be used safely in patients allergic to ester anesthetics. Local anesthetics can produce systemic effects upon entering the circulation because they are not metabolized at the site of injection. The development of systemic effects depends on the level of anesthetic circulating in the blood. Toxic blood levels can be reached more rapidly when the local anesthetic is injected directly intravascularly or when large doses of anesthetic are administered. Toxicity can result at lower levels in elderly persons, children, and patients who are critically ill. The maximum dose of lidocaine is 8-11 mg/kg for an adult. The maximum dose for bupivacaine is 2.5-3.5 mg/kg, and the maximum dose for procaine is 10-14 mg/kg. When the local anesthetic is mixed with epinephrine, higher doses of anesthetic can be tolerated. Generally, the maximum dose of epinephrine injected in healthy individuals should not exceed 1 mg, ie, 100 mL of 1:100,000. However, lower quantities of epinephrine can precipitate adverse systemic effects in patients with certain underlying diseases. [3, 19, 8, 21] Pretreatment with midazolam has been shown to effectively raise the convulsive threshold for lidocaine, bupivacaine, and etidocaine. [22, 23] Moreover, the injection should be terminated if the patient experiences a metallic taste, circumoral numbness, tinnitus, or facial twitching. Early symptoms of local anesthetic overdose include headache, tinnitus, circumoral and tongue paresthesias, restlessness, talkativeness, facial twitching, convulsions, respiratory arrest, and cardiac depression.Reactions to epinephrine are occasionally confused with local anesthetic toxicity, which differentially results in palpitations and restlessness within 1-2 minutes of injection. Reaction to local anesthetic overdose usually takes 20 minutes, when peak blood levels are reached. As blood levels rise, generalized convulsions can result, followed by respiratory arrest. Cardiac depression can occur, with impaired conduction leading to bradycardia and eventual asystole. Further contributing to cardiovascular depression, local anesthetics cause vascular dilatation, which worsens blood pressure. Harmatz A. Local anesthetics: uses and toxicities. Surg Clin North Am. 2009 Jun. 89(3):587-98. [Medline]. de Jong RH. Local Anesthetics. 2nd ed. Thomas: Springfield, Ill: Charles C; 1977. 197-202. McLaughlin CW Jr. Postoperative gangrene of the finger following digital nerve block anesthesia. Am J Surg. 1942. 55:588. O'Neil EE, Byrne JJ. Gangrene of the finger following digital nerve block. Am J Surg. 1944. 64:80. Burnham PJ. Regional block anesthesia for surgery of the fingers and thumb. Ind Med Surg. 1958 Feb. 27(2):67-9. [Medline]. Sylaidis P, Logan A. Digital blocks with adrenaline. An old dogma refuted. J Hand Surg Br. 1998 Feb. 23(1):17-9. [Medline]. Porter JM, Inglefield CJ. An audit of peripheral nerve blocks for hand surgery. Ann R Coll Surg Engl. 1993 Sep. 75(5):325-9. [Medline]. [Full Text]. Wilhelmi BJ, Blackwell SJ. Epinephrine in the finger. Plast Reconstr Surg. 2002 Sep 1. 110(3):999; author reply 999-1000. [Medline]. Chiu DT. Transthecal digital block: flexor tendon sheath used for anesthetic infusion. J Hand Surg Am. 1990 May. 15(3):471-7. [Medline]. Poulton TJ, Mims GR. Peripheral nerve blocks. Am Fam Physician. 1977 Nov. 16(5):100-9. [Medline]. Wilhelmi BJ, Snyder N 4th, Verbesey JE, Ganchi PA, Lee WP. Trigger finger release with hand surface landmark ratios: an anatomic and clinical study. Plast Reconstr Surg. 2001 Sep 15. 108(4):908-15. [Medline]. Keyser JJ. Establishing the site of the A-1 pulley. Plast Reconstr Surg. 2002 Jun. 109(7):2606-7; author reply 2607. [Medline]. Aldrete JA, O'Higgins JW. Evaluation of patients with history of allergy to local anesthetic drugs. South Med J. 1971 Sep. 64(9):1118-21. [Medline]. Ramamurthy S, Hickey R. Anesthesia. Green DP, Hotchkiss RN, Pederson WC, eds. Green's Operative Techniques in Hand Surgery. 4th ed. New York, NY: Churchill Livingstone; 1998:22. Moulds RF. Reduced responses to noradrenaline of isolated digital arteries from hypertensives. Clin Exp Pharmacol Physiol. 1980 Sep-Oct. 7(5):505-8. [Medline]. Auletta MJ, Grekin RC. Local Anesthesia for Dermatologic Surgery. New York, NY: Churchill Livingstone; 1985. 59-74. Scott DB. Techniques of regional anesthesia. Norwalk, Conn: Mediglobe. 114. 1989. Mirkheshti A, Aryani MR, Shojaei P, Dabbagh A. The Effect of Adding Magnesium Sulfate to Lidocaine Compared with Paracetamol in Prevention of Acute Pain in Hand Surgery Patients Under Intravenous Regional Anesthesia (IVRA). Int J Prev Med. 2012 Sep. 3(9):616-21. [Medline]. [Full Text]. Sylaidis P, Logan A. Re: Epinephrine in digital blocks: revisited. Ann Plast Surg. 1999 Nov. 43(5):572. [Medline]. de Jong RH, Bonin JD. Benzodiazepines protect mice from local anesthetic convulsions and deaths. Anesth Analg. 1981 Jun. 60(6):385-9. [Medline]. Torbiner ML, Yagiela JA, Mito RS. Effect of midazolam pretreatment on the intravenous toxicity of lidocaine with and without epinephrine in rats. Anesth Analg. 1989 Jun. 68(6):744-9. [Medline]. Albright GA. Cardiac arrest following regional anesthesia with etidocaine or bupivacaine. Anesthesiology. 1979 Oct. 51(4):285-7. [Medline]. Winnie AP. Regional anesthesia. Surg Clin North Am. 1975 Aug. 55(4):861-92. [Medline]. Frank R, Cowan BJ, Lang S, Harrop AR, Magi E. Modification of the forearm tourniquet techniques of intravenous regional anaesthesia for operations on the distal forearm and hand. Scand J Plast Reconstr Surg Hand Surg. 2009. 43(2):102-8. [Medline]. Aslan B, Izdes S, Kesimci E, Gümüs T, Kanbak O. [Comparison of the effects of lidocaine, lidocaine plus tramadol and lidocaine plus morphine for intravenous regional anesthesia]. Agri. 2009 Jan. 21(1):22-8. [Medline]. Viscomi CM, Friend A, Parker C, Murphy T, Yarnell M. Ketamine as an adjuvant in lidocaine intravenous regional anesthesia: a randomized, double-blind, systemic control trial. Reg Anesth Pain Med. 2009 Mar-Apr. 34(2):130-3. [Medline]. Kaabachi O, Ouezini R, Koubaa W, Ghrab B, Zargouni A, Ben Abdelaziz A. Tramadol as an adjuvant to lidocaine for axillary brachial plexus block. Anesth Analg. 2009 Jan. 108(1):367-70. [Medline]. Sims N. Upper extremity anesthesia. McCarthy JG, May JW Jr, Littler JW, eds. Plastic Surgery. Philadelphia, Pa: WB Saunders; 1990. 4302. Macaire P, Singelyn F, Narchi P, Paqueron X. Ultrasound- or nerve stimulation-guided wrist blocks for carpal tunnel release: a randomized prospective comparative study. Reg Anesth Pain Med. 2008 Jul-Aug. 33(4):363-8. [Medline]. Luyet C, Constantinescu M, Waltenspül M, Luginbühl M, Vögelin E. Transition from nerve stimulator to sonographically guided axillary brachial plexus anesthesia in hand surgery: block quality and patient satisfaction during the transition period. J Ultrasound Med. 2013 May. 32(5):779-86. [Medline]. Wilhelmi BJ, Blackwell SJ, Miller JH, et al. Do not use epinephrine in digital blocks: myth or truth?. Plast Reconstr Surg. 2001 Feb. 107(2):393-7. [Medline]. BRADFIELD WJ. Digital block anaesthesia and its complications. Br J Surg. 1963 Mar. 50:495-8. [Medline]. Kaufman PA. Gangrene following digital nerve block anesthesia. Arch Surg. 1941. 42:929. Cousins MJ, Bridenbaugh PO. The upper extremity: somatic block. Cousins MJ, Bridenbaugh PO, eds. Neural Blockade in Clinical Anesthesia and Management of Pain. 3rd ed. Philadelphia, Pa: Lippincott-Raven; 1997. 362-70. Dillon D, Gibbs MA, Baby C. Peripheral nerve blocks of the hand. Acad Emerg Med. 2007 Jan. 14(1):14-5. [Medline]. Ferrera PC, Chandler R. Anesthesia in the emergency setting: Part I. Hand and foot injuries. Am Fam Physician. 1994 Sep 1. 50(3):569-73. [Medline]. Fremling MA, Francel T, Weeks PM. Evaluation of Hand Injuries. Martin DS, Collins ED, eds. Manual of Acute Hand Injuries. St. Louis, Mo: Mosby-Year Book; 1998. 87-92. Gilman AG, Rall TE, Nies AS. Local anesthetics. Gilman AG, Rall TW, Nies AS, Taylor P, eds. Goodman and Gilman's The Pharmacological Basis of Therapeutics. 8th ed. New York, NY: Pergamon; 1990. 311-33. Hutton KP, Podolsky A, Roenigk RK, Wood MB. Regional anesthesia of the hand for dermatologic surgery. J Dermatol Surg Oncol. 1991 Nov. 17(11):881-8. [Medline]. Kasten GW, Martin ST. Bupivacaine cardiovascular toxicity: comparison of treatment with bretylium and lidocaine. Anesth Analg. 1985 Sep. 64(9):911-6. [Medline]. Knoop K, Trott A, Syverud S. Comparison of digital versus metacarpal blocks for repair of finger injuries. Ann Emerg Med. 1994 Jun. 23(6):1296-300. [Medline]. Leversee JH, Bergman JJ. Wrist and digital nerve blocks. J Fam Pract. 1981 Sep. 13(3):415-21. [Medline]. Maneksha FR. Techniques and drugs for regional anesthesia in surgery of the hand. Orthop Rev. 1987 Jun. 16(6):417-24. [Medline]. Melone CP Jr, Isani A. Anesthesia for hand injuries. Emerg Med Clin North Am. 1985 May. 3(2):235-43. [Medline].